Good:Rookie Auto Variety, Pro Helmet Auto's, Base Set SP Rookies, Base Set Rookie Variation SP's, NFL Jerseys, New Sideways Base Rookie Card Design, Value, Quad Relics, First Favre Vikings' Relic Cards. Bad:Insert Overload, "Sherzee" cards, foil board inserts feel out of place, Blue Draft Pick Parallels get annoying, sticker drops looks awful on glossy stock cards. 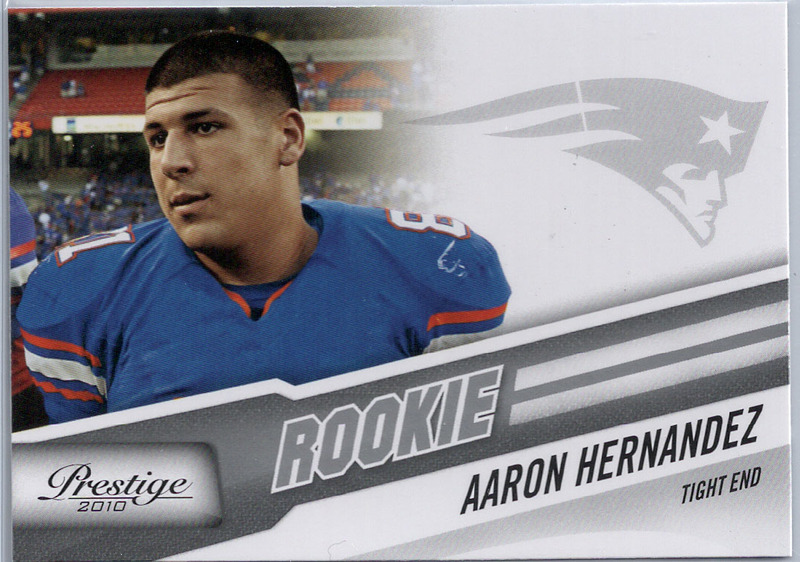 Bottom Line: I'm usually not a fan of Prestige, but the loss of the NCAA license might have been the best thing to happen to Panini's NFL kick-off card brand. With NFL uniforms in play for rookies, the value of Prestige could hold up better in the long run. 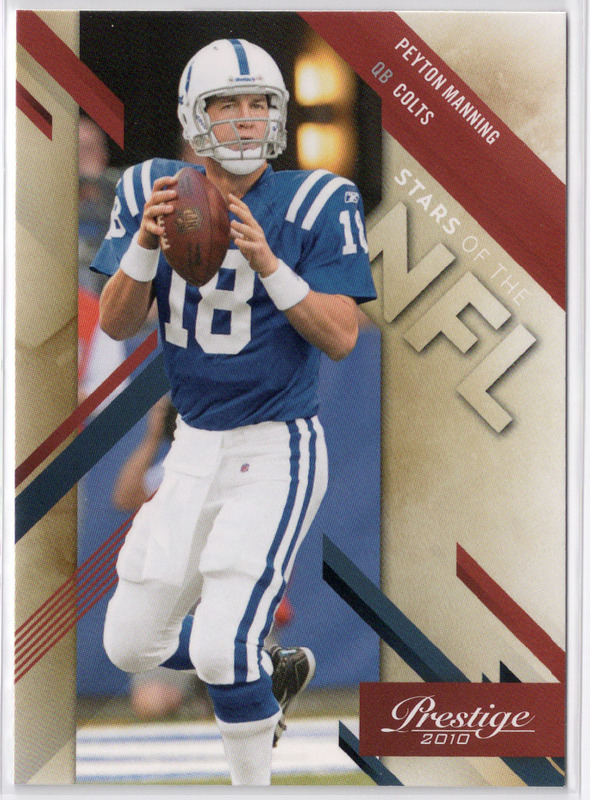 In years past, post-draft football products end up getting slaughtered once the season starts and the true football card season begins. 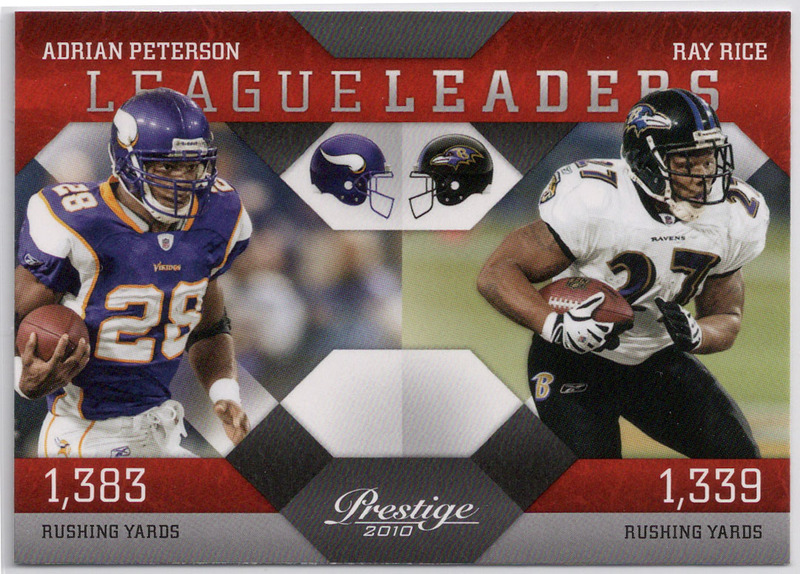 This year I have a sneaking suspicion that the value of Prestige will retain throughout the entirety of the 2010 football card season. If you enjoy football and rookies, you will enjoy this product, it's that simple. With a box price of around $90, the price is right to rip with little risk. 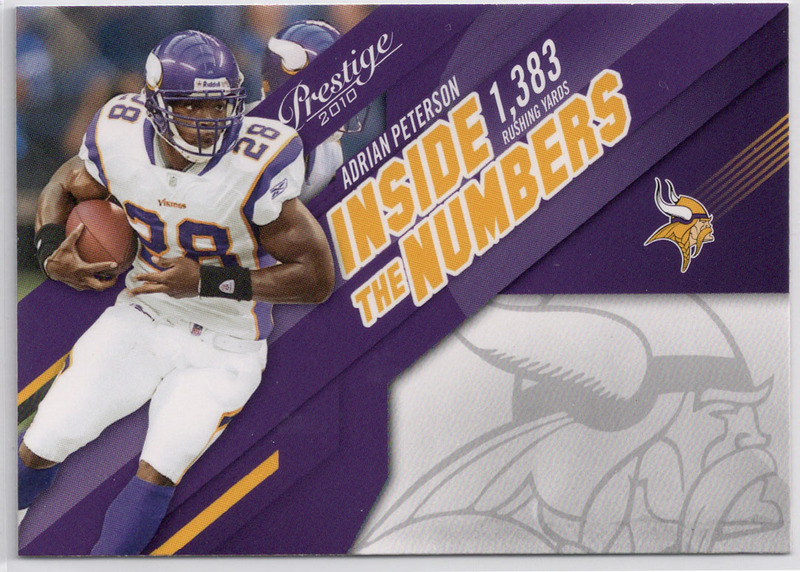 All in all, 2010 Prestige if a fun football product with some extremely cool cards hiding inside it's packs. 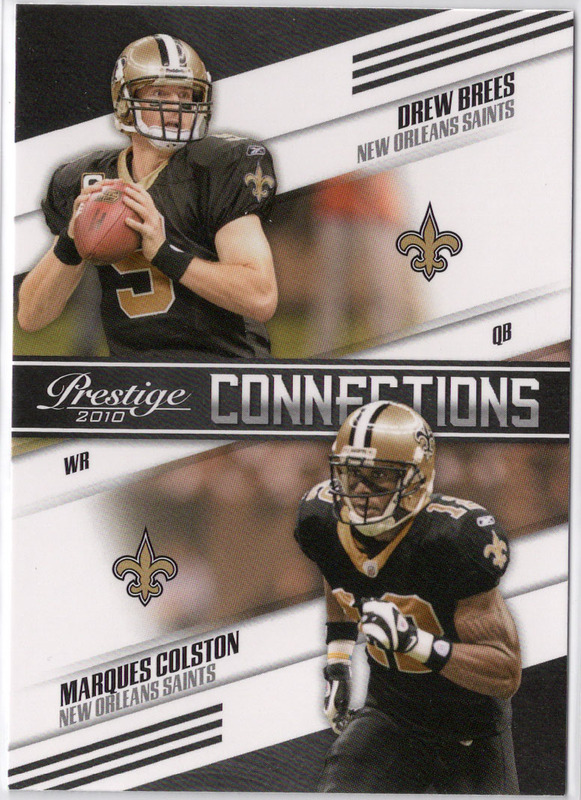 2010 Prestige's card design is a major improvement upon past seasons in my opinion. The choice to go with a horizontal lay-out for base rookies was a great idea that has led to some surprisingly sharp looking cards. 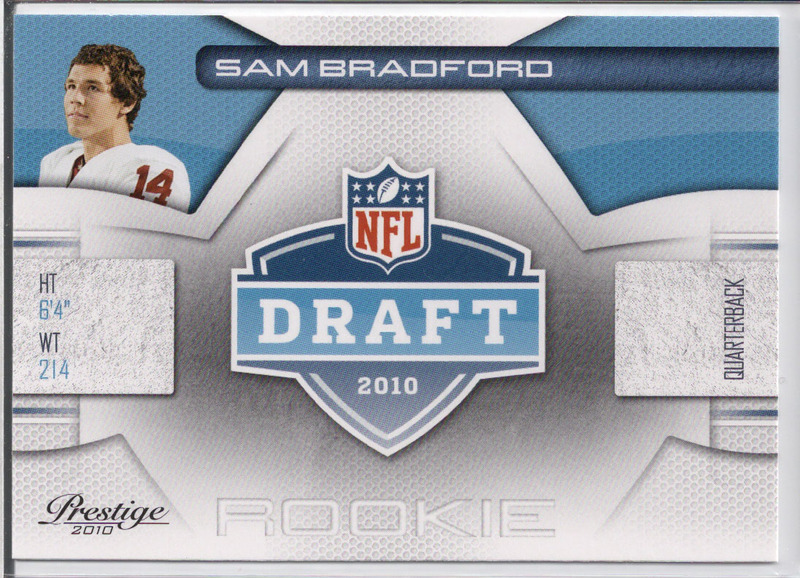 The NFL Shield, NFL Logo, and NFL Draft Patch auto's look amazing, It's an ingenious way of limiting the amount of sticker drops. Last year, I was a big fan of Gridiron Gear's Pro Helmet Auto's, I think it was a great move to move them into the Prestige lineup, the great thing is that I believe most, if not all feature an on-card auto. 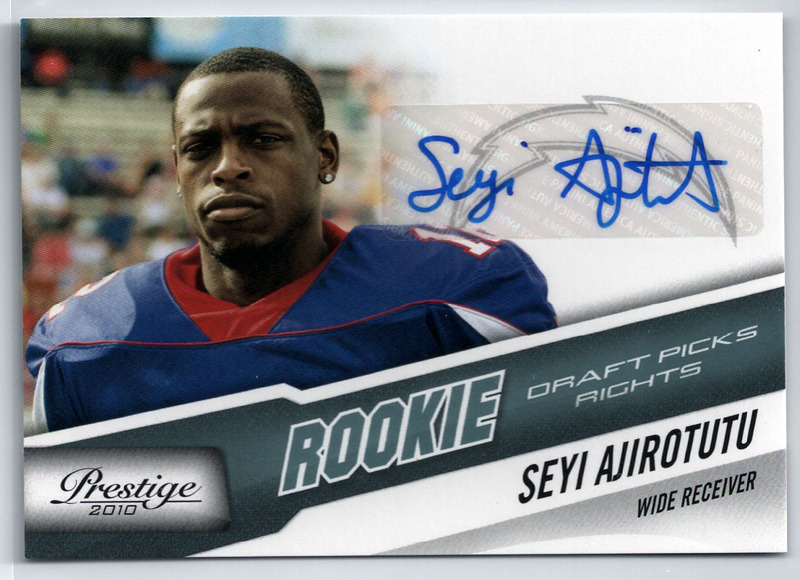 The only cards I thought were ugly were the occasional sticker drop rookie auto and a few of the inserts. 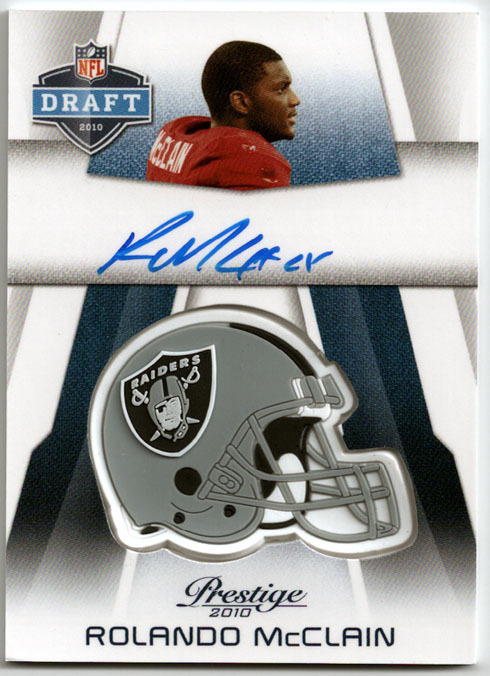 For some reason, a sticker drop on Panini stock looks more ugly than when other companies do it. If only every card company understood the fine art of the base set Short Print as well as Panini! 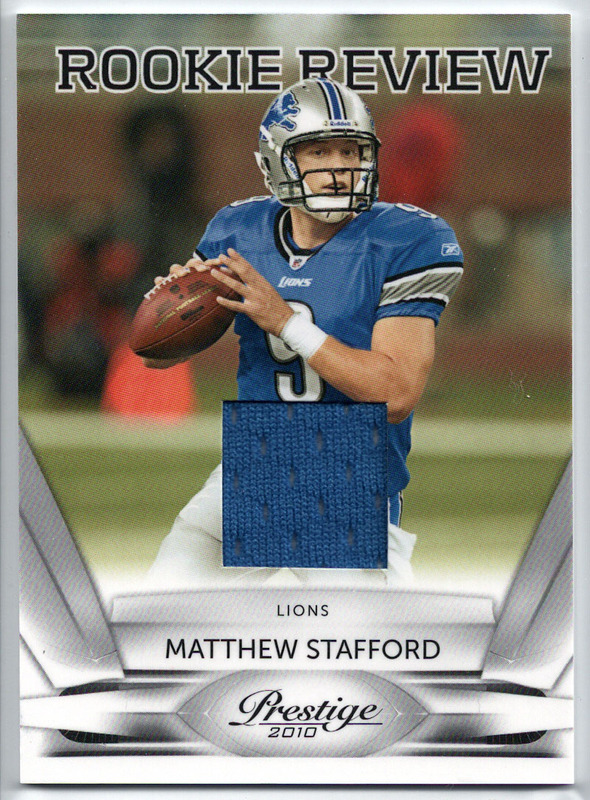 Not only do you get 4 hits in a box, you also get a few short prints that can end up being extremely valuable. I like how they vary the print run of each Short Print and let the market determine the value instead of giving us a concrete print run. 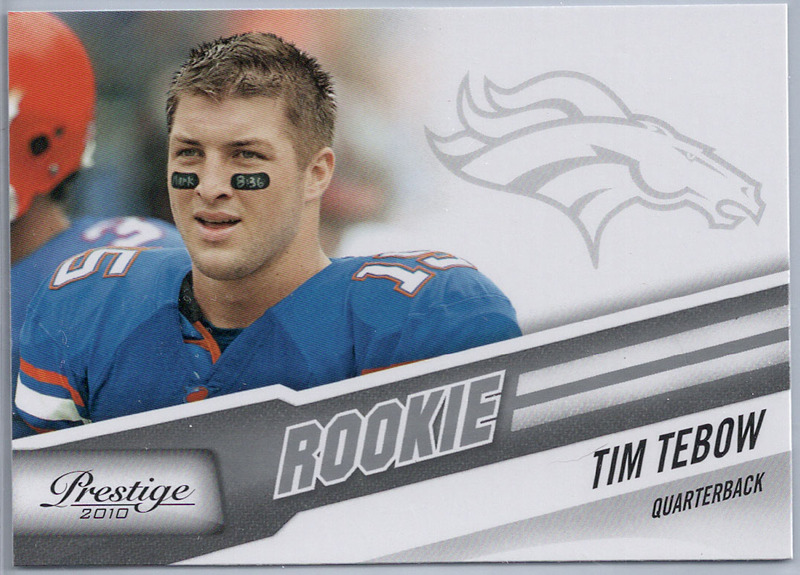 Another thing that helps the value of this years' Prestige are the amount of hobby friendly names, especially Tim Tebow, who not only has Broncos' fans chasing his cards, but Gator nation as well. 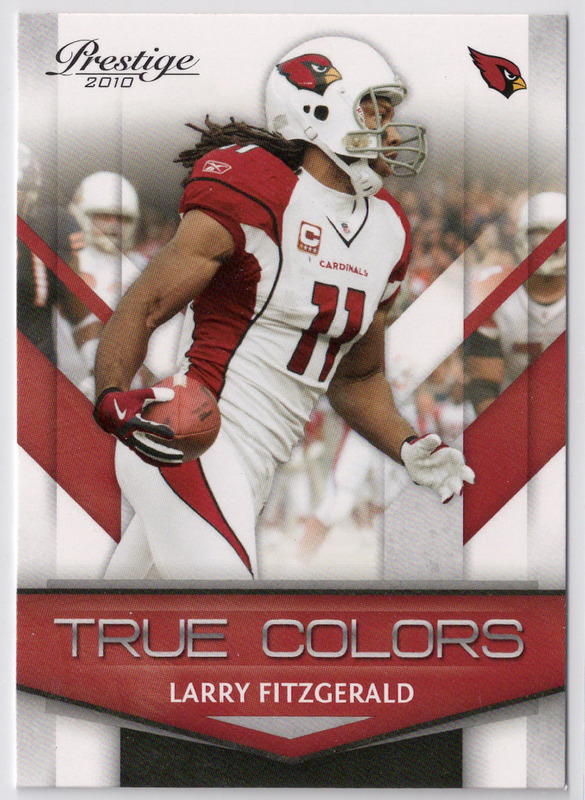 The college collector is a growing demographic in cards that cannot be ignored. 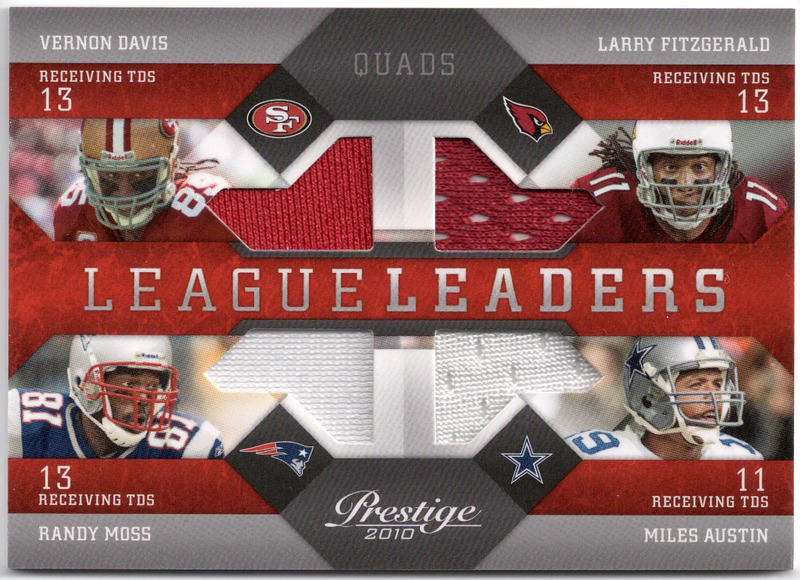 You can't ask for much more from a pre-season football card offering. 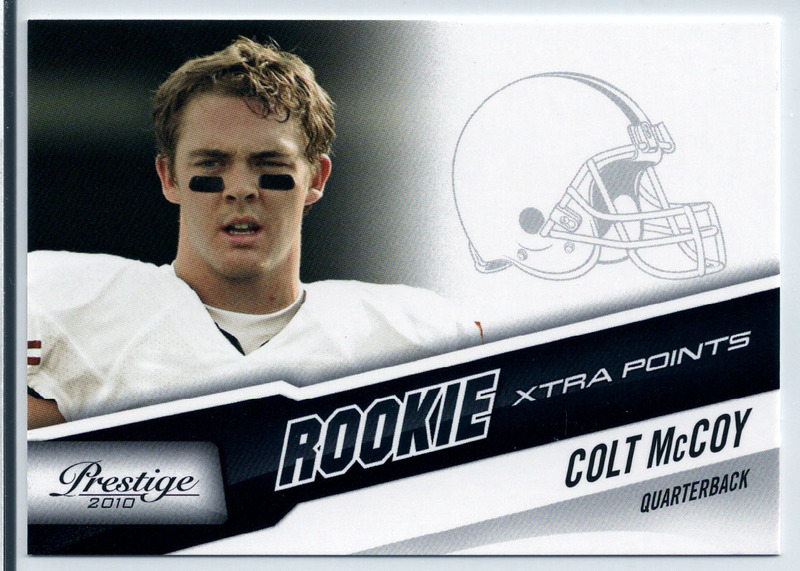 Prestige has a rich rookie checklist; the base set is deep with rookies and the auto checklist contains a who's who of the 2010 NFL Draft Class. As a Vikings fan, a major bonus on the checklist is the presence of the first ever Favre Vikings relic cards! 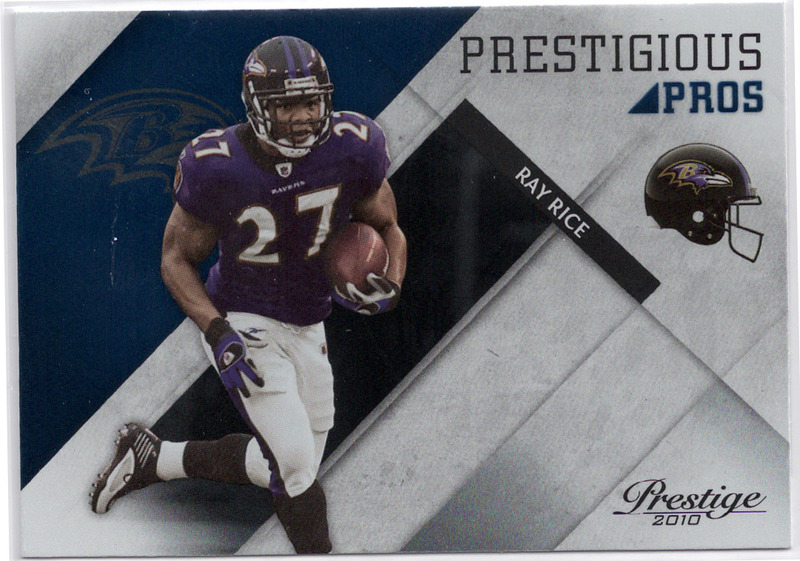 I usually don't enjoy early football products very much, but this years Prestige caught me off guard. Usually, I end up with a major case of buyers remorse after purchasing a pre-season football product, but I found this years Prestige extremely enjoyable to open. The SP's, Rookie Auto's, Quads, and the chance of pulling the first Favre Vikings relic made for an extremely enjoyable rip. Box Configuration: 24 packs per box, 8 cards per pack. 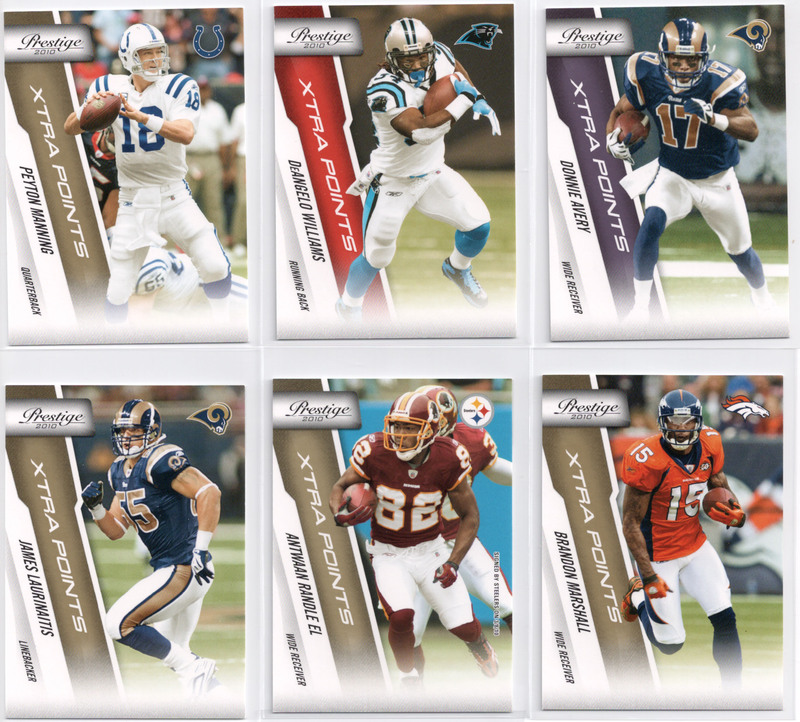 Top NFL Rookies From The Class of 2010 with Autographed Versions to 299 or Less! NFL Draft Class NFL Shield Logo Featuring a Trapped, Autographed, Embroidered 2010 NFL Shield Logo Patch Numbered to 10 or Less! Collegiate Lettermen Featuring An Autograph Within a Letter of a Top Rookie's Last Name From The Class Of 2010! I would give this product a 5/5. I like the new rookie design, it’s simple and catchy. All of the rookie autographs and helmet cards are nice! Even some of the one’s that aren’t valuable now could be great in the future. I think Panini took a big step forward this year with this product. I really liked it. I feel like it is a rookie based product with lots of inserts. My box yielded some good hits. It is a good bang for your buck type of box. I give it a 4 out of five. Panini products are the worst their is along with poor customer service. Poor box ratios along with crappy pricing. I give all their products 0/5 just worthless. 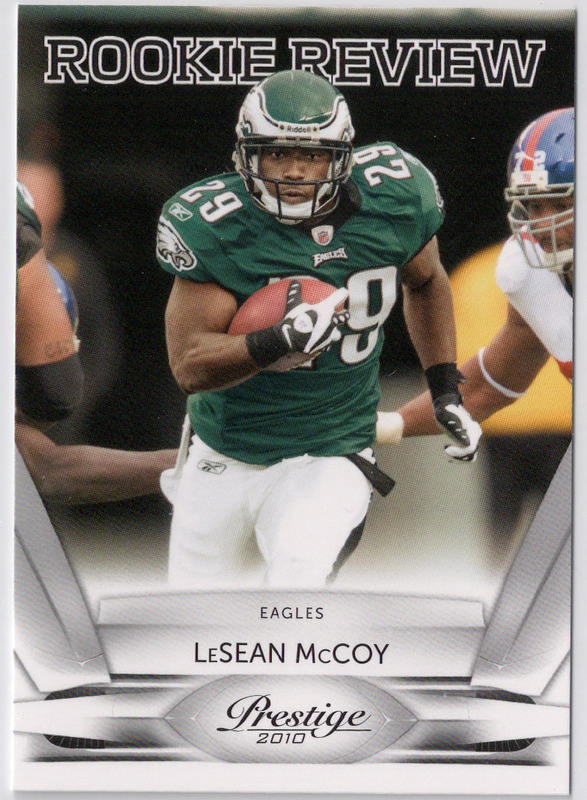 Topps,Upper Deck will always be better hopefully they get bought out by one of these companys.